Elections and choices make headlines this month. On March 20, 2019 elections were held in the Netherlands for the provincial councils and for the water management boards. The results of the election for the Provinciale Staten matter for the continuity of the current cabinet, because members of the Staten will elect senators later this year. To all political turmoil a terrible shooting incident in my peaceful home town Utrecht on March 18 added an atmosphere of shock, disbelief, grief and much more, depending on your closeness to the spot and the people afflicted. Last Friday a silent march has been held to the square where a woman and two men were killed. I had to reflect about a theme for a new post. Last week the online Revoke Article 50 petition in the United Kingdom called my attention. Instead of stepping into the vexed questions around the Brexit I think looking at a late nineteenth-century petition is well worth attention here. The Volkspetitionnement 1878 [People’s Petition 1878] was held as a plea to secure space and governmental subvention for Christian education. Some 300,000 Protestants and 164,000 Catholics signed this petition. In the project led by the Vrije Universiteit Amsterdam and the Radboud Universiteit Nijmegen the data of the petition have been used to create a searchable database and an interactive map. This petition was held in a period with a much smaller electorate, just 100,000 men, and even before the first Dutch political party came into existence. The project to create online access to the 1878 petition is a project of many institutions and also the general public. In 2016 the Vrije Universiteit Amsterdam started the project after the Dutch National Archives had made 11,000 scans. At the crowdsourcing platform Vele Handen [Many Hands] volunteers could read the scans and enter the data into a database. In June 2017 the project website was launched. The Nationaal Archief in The Hague has a concise news item about the project on its website, with a link to the scans of the original petition [NA, finding aid no. 2.02.04, Kabinet des Konings (The Kings’ Cabinet), inv.nos. 4482-4502 (Protestants) , 4541-4547 (Catholics)]. In 1878 a law was passed in the Dutch parliament which stipulated only general public schools for primary education could receive financial support from the government. Christian political leaders felt injured and sought a way to get this law repelled. Among these leaders was no lesser figure than the Protestant theologian and politician Abraham Kuyper (1837-1920) who founded in 1872 the newspaper De Standaard [The Standard], in 1879 the first Dutch political party, the Anti-Revolutionaire Partij, and in 1880 the Vrije Universiteit. From 1901 to 1905 he acted as prime minister. You might want to look for his published works in the Kuyper Digital Library and the vast Kuyper Bibliography in the digital collections of Princeton Theological Seminary. His legacy is among the cores of the documentation center for the history of Dutch Protestantism, the HDC of the Vrije Universiteit. The project website gives a good overview of the actual history of the 1878 petitions, and I use the plural on purpose. In 1877 the liberals had gained power. While Dutch Protestants had already for decades followed the changes in Dutch education, the 1878 law brought first of all Dutch Catholics into action. 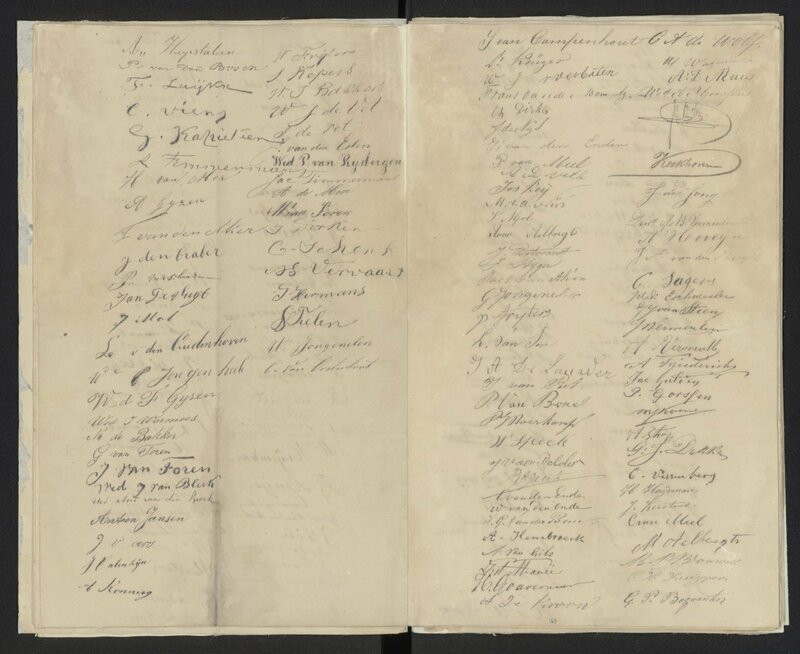 In June 1878 they launched three petitions, respectively to the members of the Tweede Kamer, the Senate and king Willem III, raising respectively 148,000, 164,000 and 164,000 signatures. A month the better organized protestant movement succeeded in raising 305,000 signatures within one week. However, on August 17, 1878 the king confirmed the new law. On the project website you can find a succinct bibliography (PDF) about this movement which did not reach its immediate goal, but certainly helped creating political awareness and stressing the need for a more effective organization of political opposition. At the project website you can search for individuals who signed one of the petitions, using their family names and for locations, or use the interactive maps to gain insights into the number of signatures placed in particular provinces and locations by a specific religious denomination or by both denominations. For each person who signed at least his name and (abbreviated) Christian name, residence and denomination have been registered, but the results page provide also space for other information, notably profession and the number of children, and a link to a scan of the page with the signature. I could not resist to check whether of my ancestors signed the petition. In my line of descent some names return regularly, and many of them lived in the western part of the province Noord-Brabant, mainly in Breda, Etten-Leur and Oudenbosch. One of the two Hendrikus Vervaart’s in Oudenbosch is surely my great-grandfather. I compared this scan with his signature in the marriage registration held at the West-Brabants Archief in Bergen op Zoom. Provided additional information has been entered in the database or that you have found elsewhere information about an ancestor, this resource surely adds color to the history of your family. You can press a button Informatie toevoegen (Add information) to enrich the data. It is nice to see the double use of crowdsourcing in this project. To say the least, the Protestants and Catholics of 1878 would surely find the cooperation for this digital project remarkable, but in fact both movements found each other as political partners in dealing with the Schoolquestie, the question about the way to get funding from the government for schooling along denominational lines. In 1879 Kuyper formed a political party. In 1888 a first Dutch cabinet led by the confessionelen was formed which succeeded in getting equal financing of neutral and denominational schools. Over the years this political cooperation was not always easy, but a century later the major Catholic party and two Protestant parties merged into one political party. The massive response to these petitions made especially the Catholics more visible in the Netherlands. Their existence in a nation styling itself as totally “Reformed” had almost been denied by historians. It showed in a graphic way the very limited franchise to vote of the late nineteenth century. It proved to be a spur to Abraham Kuyper to develop his visions of Christian life and organization in modern society, famously abbreviated as sovereignty in your own circle. He helped shaping a country which became for decades dominated by societal pillars, zuilen, subsections of a society in which one could live to a large extent from the cradle to the grave without serious interaction with other groups. As for the present role of petitions and their future, I do not think historians can provide blueprints for the future, but they can make you pause for thought and reflection, and help you to see current developments in multiple perspectives. The website of the Volkspetitionnement 1878 offers a window on a very interesting period in Dutch politics and government, if only already for the fact it was composed of four petitions. This entry was posted in Archives, Digital projects and tagged Crowdsourcing, Digital archives, Legal history, Netherlands, Political history, Religious history on March 26, 2019 by rechtsgeschiedenis.